Perhaps more so than people who prefer to stay within their home countries, frequent travelers well know the value — nay, the practical necessity — of smartphones for making voice calls, sending text messages, and accessing the web directly in a browser or indirectly when apps need to connect to their remote servers. Savvy mobile users generally prefer prepaid monthly SIM cards — as opposed to long-term contracts — partly because there are no hidden charges and one can often register online and later easily pay for subsequent months. With approximately 1.5 million US citizens living in Mexico and approximately 9 million US citizens visiting that country every year, it should be expected that there would be strong demand for prepaid mobile phone plans that offer coverage in both countries. Given that reducing one's cost of living is one of the major reasons those citizens emigrate to Mexico to live full-time — or at least vacation there instead of more distant and expensive destinations — we should also expect that mobile phone companies would be competing vigorously against one another by offering low-cost plans. At least, that was my hope, as I began the process of researching and comparing prepaid plans that could meet my own needs during the next few years. Specifically, I was interested in any option that meets the following criteria: The plan allows one to talk and text in the major US and Mexican cities up to one hour and 1 GB per month, respectively. The states I am most interested in are Texas, Guanajuato, and Querétaro — although this preference may be inconsequential if all of the selected phone companies provide adequate coverage for all the major US and Mexican cities. Because the intended usage will consist mostly of contacting Airbnb hosts and requesting Uber rides, and not lengthy phone conversations or chat sessions, I do not anticipate ever coming close to the limitations of any chosen plan. Thus I would prefer a plan that rolls unused minutes and gigabytes forward into subsequent months, and especially a plan that does not disable the account or the SIM card due to a lack of usage for months at a time (i.e., when I am settled in a location for a while and am exclusively using Wi-Fi and not the mobile phone network). In this survey, I will consider all of the major companies (in alphabetical order) that I have heard of so far that apparently meet the above criteria. Extra features, such as support for a mobile hotspot or streaming high definition (HD) video, will not be considered. All of the information is believed to be accurate and current as of this writing, but of course will likely change in the future as the competitors modify their offerings. So how is Ma Bell coping in the modern age of cellular and Internet technology? Still dependable but overpriced? The AT&T prepaid plans start at $35 (USD) per month (or $30 with auto-pay) and top out at $85 ($80 with auto-pay). The company also offers a $30 plan with talk and text but no data; a $2 per-day plan that costs only on days when it is used; and a $0.25 per-minute plan for talk only. Returning to the main plans, the cheapest, at $35 per month, provides unlimited talk and text (text, picture, and video messaging) in the United States, unlimited text in Mexico and more than 100 other countries, plus 1 GB of data, but no calling in Mexico. To add that feature requires one to instead pay $45 (or $40 with auto-pay), but for the extra $10 one receives an additional 5 GB of data as well as service in Canada. Some more information is available on the Mexico & Canada page. Would AT&T be a good option for someone who does not intend to consume many calling minutes or text messages per month, and perhaps none at all during some months? Is it possible to suspend service — or at least the sizable monthly charges — when not needing it? One online commenter noted that he is able to keep his AT&T prepaid number active, by maintaining a $100 credit in his account, and it does not cost him anything during the months that he does not use it because during that time he switches to their $0.25 per-minute plan and makes no calls. However, on the AT&T website, the fine print suggests a potential problem with this strategy: "Both the number of texts and number of voice minutes used, made, or received in Mexico and Canada cannot exceed 50% of the total number of texts or voice minutes in a month for any consecutive three-month period, or service may be terminated." If one were to go three months on a per-minute plan, and make no calls or texts, then 50% of those totals would also be zero. Does this imply that if you were to then switch back to the $45 per-month plan, for instance, and you tried to make some calls and texts in Mexico, would your account be terminated? Also, how easy is it to switch between plans and is there a charge for doing so? You may be tempted to seek an answer to these or any other questions by going to the "Contact Us" page for their prepaid plans, but there you will discover that chat support is not available, and if you call either one of the customer support phone numbers, you can only listen to largely useless recordings, with no way to reach a human representative. When assessing the four services made available, any owner of a GSM-capable unlocked smartphone who seeks more than just data access, would undoubtedly choose the 3-in-1 SIM Card Kit, which promises free mobile service globally — although it is unclear how that could be achieved given that the company is using networks in only four countries. 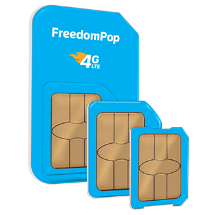 The 3-in-1 SIM Card Kit has two options, the first of which, Mobile Phone Service, promises 4G LTE and 3G network coverage, a new phone number if you want one, and Wi-Fi calling and texting "anywhere" (in the United States or worldwide?). It also promises free unlimited calling and texting with other FreedomPop customers. That could prove valuable, because if the service works well for you, then you could convince family and friends to switch over. Also, there are hundreds of thousands of other FreedomPop customers (according to The New York Times). 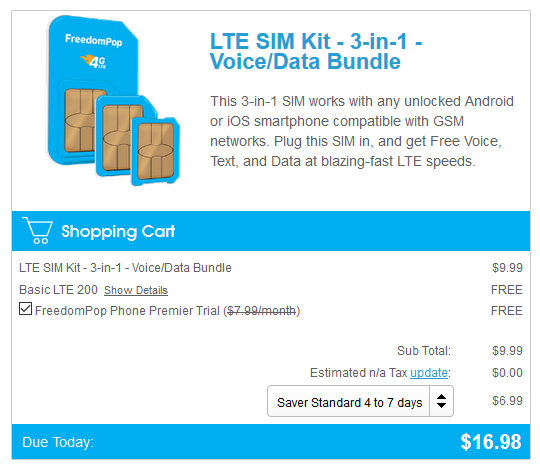 The total cost for the SIM card, including regular shipping, is $16.98. Mobile Phone Service itself has three options, the cheapest of which is the Basic LTE 200 plan, which is apparently free and includes 200 minutes of talk, 500 text messages, and 200 MB of data usage per month. According to author and FreedomPop customer David Hathaway, you can choose that option and then disable the auto-billing feature in your account to prevent accidentally going over the limits, and thereby never have to pay for any excess usage. The company also offers prepaid plans, the most affordable of which is the $24.99 plan, which includes unlimited calling and text, plus 2 GB of data. That cost can be reduced by paying for 12 months, bringing the per-month cost down to $9.99. The Prepaid Data SIM Card Wiki comments that "As a freemium provider FreedomPop needs users to sign up for add-on services. They make it easy to add extra cost plans and services, but quite hard to remove them. When you order their 'free SIM', by default you get signed up for multiple offers and add-ons which are advertised as 'free trials'. However they are only free for the first month, if you don't cancel them before the month is up, they will automatically renew and you will be charged for subsequent months. To disable extra cost services you don't want: Go to My Account > Services and click the Deactivate link next to the services name. Note, that free customers don't get any customer support whatsoever." The virtual mobile network offered by the Internet heavyweight, Google Fi (pronounced "fie" not "fee") charges a base price of $20 for unlimited calls and text, with no data, and an additional $10 for every 1 GB of data, up to 6 GB. Between 6 GB and 15 GB, the cost remains at $60 ("Bill Protection"). If you were to exceed 15 GB in a month — which apparently fewer than 1% of Google Fi customers ever do — then you may find the data rates to be slower, but you never pay anything for it. All of these services are available in the United States and more than 170 other countries, including Mexico. Calls outside the US are $0.20 per minute. In terms of supported smartphones, customers are restricted to a rather limited group of Moto X4, Nexus, and Pixel devices. Even the popular Moto G4s and G5s are not allowed. Headquartered in Madrid, Movistar operates in Spain and many other Latin American countries. On their page for prepaid plans, they have three small icons representing Mexico, the US, and Canada, but it is not clear as to what coverage is provided in those first two countries — especially the US, which is not mentioned as a serviced country on the Wikipedia page for the company. Compared to AT&T, Sprint has prepaid plans which appear to be generally more expensive. Their least expensive option, the Sprint Forward plan, has a minimum cost of $45 per month ($40 with auto-pay), and includes unlimited talk and text, unlimited international text, and up to 4 GB of data. All of their mobile plans include Global Roaming, which provides free texting and basic data, as well as $0.20 per-minute calling, in more than 185 countries, including Mexico. The Sprint website does not seem to have any information about simple per-minute plans that one might be able to switch over to temporarily during those months when one might not need access to a cellular network (i.e., Wi-Fi would be sufficient for one's needs). Even more disheartening in my case, the Sprint network only seems to support the Alcatel, iPhone, LG, and Samsung brands of smartphones — which excludes mine and likely those of many other travelers. Also, the Sprint network is known for having less geographic coverage in the United States than its competitors, such as Verizon. This company goes by the name Telcel in Mexico and Claro in all other Latin America countries. As a result of its widespread presence, it is often credited with having the best coverage. 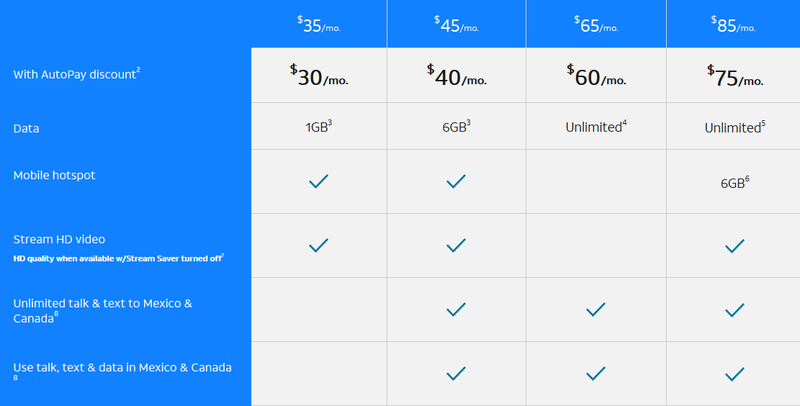 On their US website, the chart for their US prepaid plans shows a variety of options. Aside from a $25 plan that does not include data, the cheapest 30-day plan costs $30 ($28.50 with auto-refill) and includes 1 GB of data at 4G LTE speeds (and then unlimited data access at slower 2G LTE speeds). If seven days of usage would be sufficient (e.g., traveling for just a few days), then consider their plan for travelers, which for $20 ($18 with auto-refill) includes talk, text, and 2 GB of data. A representative in their customer support (800-220-9518) explained to me that if you were using a US plan while traveling in Mexico, then you would be able to request an Uber ride by accessing the Uber app over your data connection. But if for some reason the Uber driver needed to contact you, then that would pose a problem because he would see your US phone number and more than likely not be willing to make an international phone call; but at least you could request a ride. In terms of infrequent use of a plan, I was told that if you let your current plan expire, then 30 days later you lose your phone number. However, if you purchase a new plan or renew the old one before the 30 days have passed, then you retain your current number. Thus, if you did not intend or need to use the Telcel service every month, but only occasionally, then you might be able to retain your designated phone number by only paying for every other month. You definitely would not want to lose your phone number, because then you might have to purchase a new SIM card; apparently that depends not on your phone but rather on the card itself, since (he explained) some expire and others don't. To find out if my own phone is supported by Telcel, I went to the "Bring Your Own Phone" link on the "How It Works" menu, but that points to a page that only shows the error message "Error 404: CWSRV0295E: Error reported: 404". However, a support representative was able to verify that my device would be allowed. Another support representative stated that the US and Mexican plans are separate, and that if one wishes to get a US SIM card, then that could only be purchased at a Walmart store in the United States. He also noted that a US SIM card would work in both the United States and Mexico, while he was uncertain if the same would be true for a Mexican Telcel SIM card. On their Mexican website, the page for their popular Amigo service shows an even larger variety of options, based primarily on the number of days for which each plan is valid. For instance, the recommended plan lasts 15 days, costs 80 pesos (equivalent to USD $4.38 as of this writing), and apparently allows unlimited talk and text in Mexico, the US, and Canada; 200 MB of data in those three countries; and 1 GB total of WhatsApp usage in those three countries as well as Facebook and Twitter usage in Mexico. With regards to infrequent use of one of their Mexican plans, I was informed that if you are not on a monthly plan but instead recharge as necessary, and you allow the account balance to go to zero, then you have up to 60 days maximum to perform a refill before losing your assigned phone number — which is even more lenient than the US requirements. Travelers to Mexico should note that if you purchase a Telcel SIM card in a convenience store, before you can actually make any calls using it, you have to visit a Telcel store to purchase the initial minutes, regardless of how many free minutes were promised to you on the packaging. 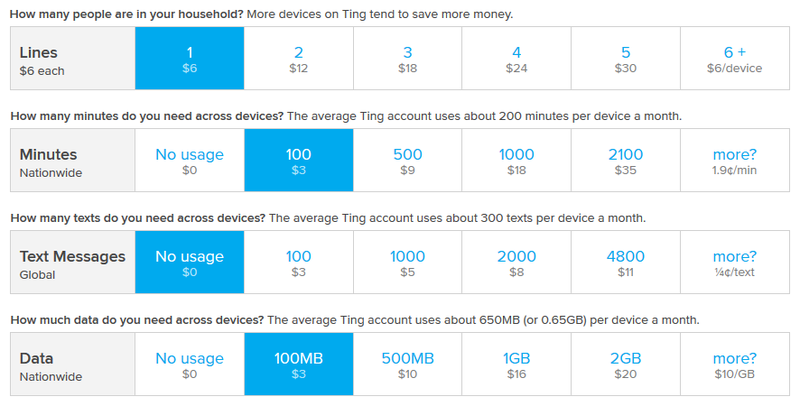 One of the lowest cost mobile virtual network operators, Ting not only eschews contracts and overage penalties, but it also allows customers to pay for only their actual usage. To illustrate this, for the travel scenario presented at the beginning of this article, a single device that is used to make fewer than 100 minutes of calls in the United States and consume less than 100 MB of data, would cost only $12 that month (as illustrated in the figure below), while a month of no usage would cost only $6 to maintain the account and phone number. Each account includes free voicemail, call forwarding, caller ID, tethering, 3-way calling, and account cancellation. Calling and texting in Mexico (as well as more than 60 other countries) does not cost extra, nor does picture and video messaging (which are counted as data usage). Like all of the leading prepaid service providers, Ting has a bring-your-own-device web page where you can enter the IMEI of your phone or tablet, and it will tell you whether or not your device is compatible with their network. In my case, it turned out that my phone is fully compatible with the CDMA and GSM networks. On both networks, international roaming is supported. In Mexico, voice calls are $0.30 per minute, data usage costs $0.30 per megabyte, and text messages are free to receive and $0.12 to send each. Prior to any travel outside the United States, if you want to use a local SIM card on the CDMA LTE network (to avoid Ting roaming charges), then you will need to follow Ting's detailed instructions on how to unlock your device for international use. With AT&T and T-Mobile currently discussing a possible merger, this option may not last long. Nonetheless, on the web page for T-Mobile's regular phone plans, visitors can read about its advantages over AT&T and Verizon — such as unlimited data up to 50 GB, monthly charges that include all fees and taxes, unlimited text and data in more than 140 countries, and free Netflix. But visitors will likely be shocked at the price tag for a single phone number: $70 every month! The service does include unlimited talk time in Mexico and Canada, as well as unlimited Wi-Fi on airplanes equipped with Gogo. Fortunately, their prepaid plans are more affordable. Of the four plans, the cheapest that includes any coverage in Mexico, is their Simply Prepaid plan, which costs $45 per month and includes unlimited talk and text in the United States, 4 GB of data, Wi-Fi calling, and the option of talk and text in Mexico and Canada. When examining the prepaid plans of Verizon for the first time, the budget consumer might feel hopeful when spotting the 500 MB for $30 plan, but sadly that does not include calling in Mexico. For that, you have to choose either the unlimited plan (for $75) or the 10 GB plan ($60). However, the budget plans do include unlimited talk and text within the United States, as well as unlimited text in Mexico and many other countries. Another nice feature is that unused data in your account rolls over to the next month. In the international calling section of their website, they describe their TravelPass plan, which for an additional $5 allows you to call from within Mexico (as well as Canada, Puerto Rico, and the US Virgin Islands). Aside from all of the providers detailed above, there are many others, including companies that claim to provide worldwide coverage and are thus better suited for people who travel frequently and to a wide variety of countries. However, these providers — such as GoSIM, KnowRoaming, OneSim, and WorldSIM — are generally more costly and focused on Europe. Also, the US phone numbers they provide may have significant limitations. Consider KnowRoaming as an example. The phone number they provide is inadequate for Uber verification because it isn't considered a normal cell phone number. Furthermore, some major Asian countries are not supported, including Malaysia. If you have no need for a regular mobile phone number or even voice calling functionality, then consider a provider that only supports data access (i.e., Internet usage) — such as GigSky and KeepGo. They may be workable solutions if you exclusively use messaging apps for real-time communication with others, but for most travelers some sort of voice calling and phone number will be needed to keep in touch with local people, including businesses, Uber drivers, etc. As for my own needs, it appears that the two most promising providers are FreedomPop and Telcel. For your own needs, have you found a satisfactory provider that does not cost you much during months of light or no usage? If you know of any affordable alternatives not covered here, and especially if you have obtained excellent results from them, please let us know in the comments below.